One sector, with spawn points dependent on who owns the sector. The spawn is a bicycle with a civilian on board so you do not spawn onto the bike. That way if the spawn point hides as you are respawning you do not get hidden. The civilian is not simulated and is only a model occupying the space on the bike. Neither the bike nor the civilian can be destroyed. Ok all of that stuff I posted about spawn points for sectors will kinda work but once you've passed that sector by, by a bit it no longer allows you to spawn there. Well thats fine in some scenarios but I generally have vehicles that spawn at sectors and I'm sure it would be better to go back and get say a tank if you want to. The sector control module hooked to the sectors is having an effect and not allowing spawns at sectors that have been passed by, hell what if you need to defend it. For some reason using triggers to make respawn markers somehow gets hooked into the sector control thing to where you can't spawn back once you've gone on ahead aways. So I just tested what I believe will work like a damn charm, so far it has anyway. Ahh my wonderful power company, an outage a month like it or not, always about 10 seconds and somehow it knocked out my internet so I'm typing this offline cause I can't post the custom composition I made. Why do this crap your doing Bailing when you could just wait until the internet comes back and not tell us at all? Cause I'm pissed. No lightening, no nothing, it is misting outside. 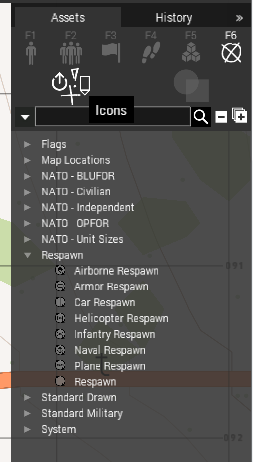 The custom composition I made will simply make a damn sector with spawn points over and over (copy and paste) and all you have to do is change the name of the sector and the name of it in the triggers. 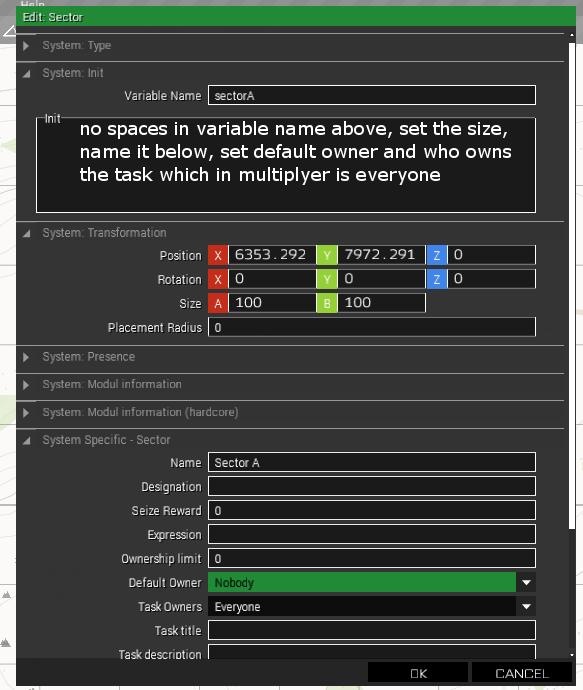 The name of the sector will change automatically anyway since the custom composition has a sector with a vaiable name of sector1 and if you copy and paste it it will change to sector1_1 and you'll have to change the name in the trigger, it does not change automatically. Change the size of the sector, doesn't matter. I'm using Kubels and Jeeps hooked/synched to regular respawn modules. Then I have one vehicle or the other hidden depending on who owns the sector. You can't spawn on a hidden vehicle. You can get trapped in one if the sector is lost while spawning in if you don't get out in time but I will look up the eject code and make the speed 0 so you'll be ejected, maybe, as soon as you spawn in. It may not work on players spawned into the vehicle. The vehicle has no fuel and can't move. Anyway, if you get trapped, all you have to do is manual respawn. The respawn timer needs to be set to 14, as far as I can tell it takes the game that long to hide vehicles. 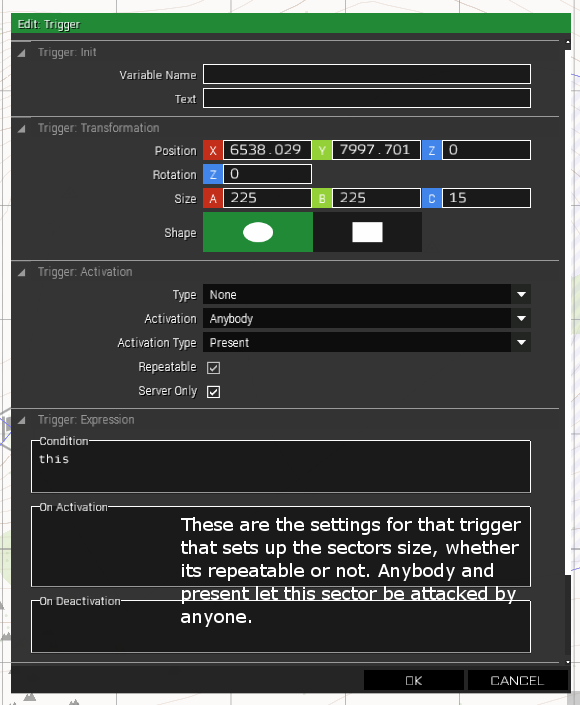 Only the sector needs a variable name so only its name needs to be changed and the name of the sector referred to in the triggers. I wanted to use ammo boxes cause you can't get trapped in them but the respawn module doesn't work that way. Anyway I will have a custom compositions up before I republish the maps, 2 of them, one will be a 7 sector setup, the variable name will be in the sector, the triggers will have it in them, the indestructable Jeeps and Kubels, hopefully with the eject script in their init. Probably not though, its not that big a deal really. 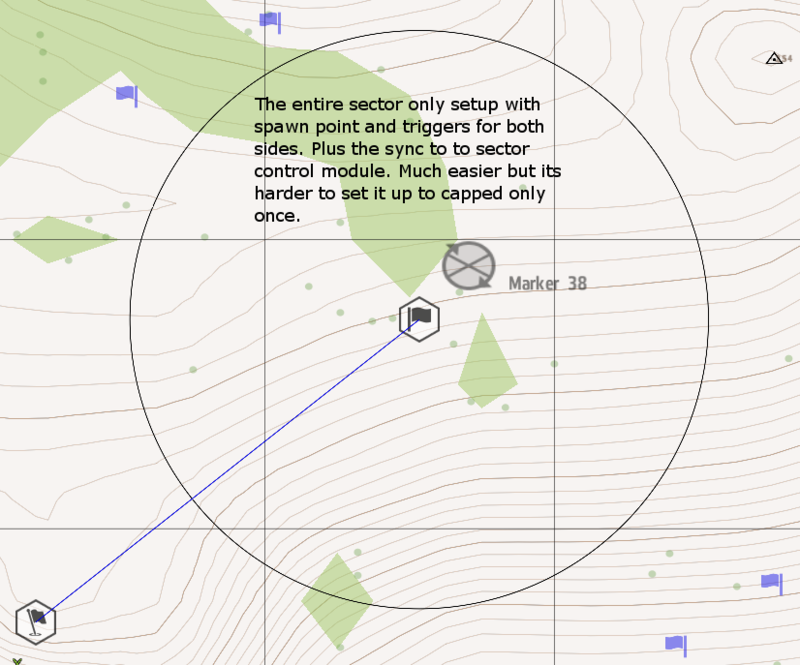 Move the sectors and the vehicles where you want them, the rest can reside on the edge of the map. Everything already synced. 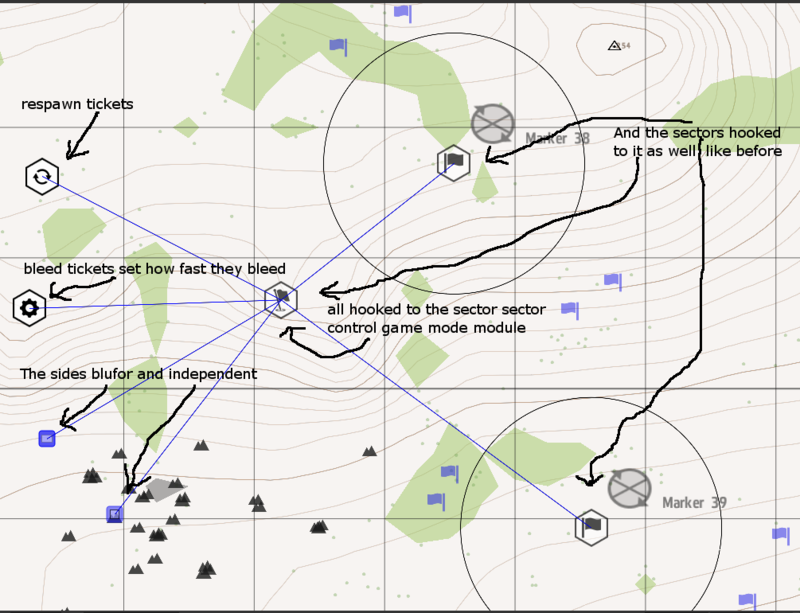 Move the vehicles around in the sector or move them a little outside the sector for a respawn just outside. 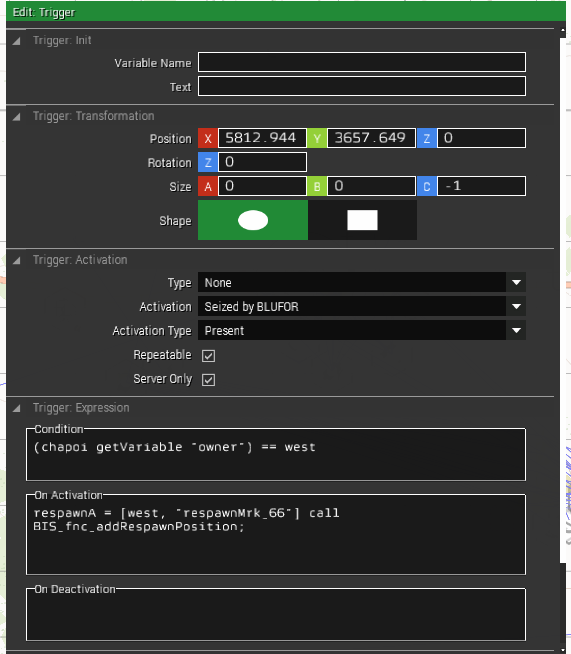 It has the sector control module, respawn tickets module and the bleed tickets module too all synced. Change how fast the tickets bleed,, the number of tickets each side, the amount of dominance needed, the amount of dominance needed just for a single sector, all dat stuff. Hell you could use it for modern or anything. Change the indestructable spawn point vehicle for whatever era. Will post them in another thread. This is a trigger which can create spawn points among other things it does. Gonna use spoilers cause this will get big. That creates a spawn point for the Germans because they own that sector (chapoi) which is like the flag zones if BF FH. I have saved respawns in my custom compositions so that all I have to do is change the name of the sector, maybe the size and not do a bunch of typing. I will do the sectors in another post, two ways to do them, not a big deal. The place you get the triggers. For this I selected the first one since it has no size, it is not being used that way so it doesn't need a size. 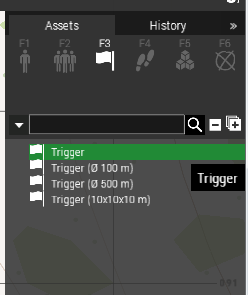 You can change the size of any of the triggers listed though so it doesn't matter. 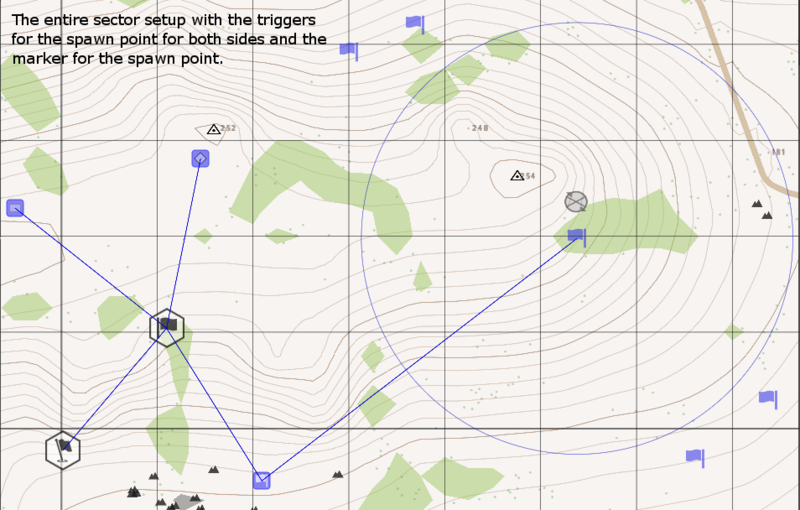 You make the marker by going to markers, then icons and the selecting respawn and picking infantry respawn. Actually I think you can pick any of them, the marker/icon itself doesn't do anything unless you have a trigger to make it a place to do something. I made it an inf respawn marker by what I put in the trigger. You have to name it the same thing that is in the trigger which is respawnmrk_66 in this case. 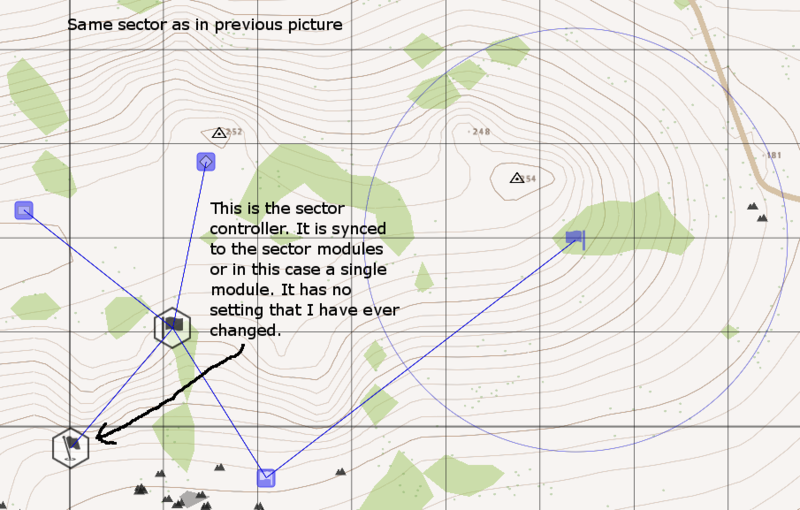 You cannot sync a marker to anything, it is synced to the trigger by what is in the trigger. How do you take that spawn point away if they lose the sector, I'm glad I asked. A second trigger which shows by the ! point in the condition that if the Germans lose chapoi they lose the spawnpoint. Oh I forgot the activation, notice it says seized by blufor in the 1rst pic, that says who is seizing the area written in the condition and so they get the spawnpoint, and in this last one where the Germans lose the spawnpoint, activation says seized by independent who will get the very same spawn point only with two other triggers using the very same marker cause why make a second marker, I'm lazy. == means whatever comes after == is true. != means whatever comes after != is false. Ok I got Mcdonalds coupons for breakfast biscuits (sausage egg and cheese) so I will come back later and do more. Last edited by Bailing_Out; 01-09-2018 at 01:36 AM. Ok I should have done this first, Sectors. 2 ways to do them. First way in this post. This way I call the old way cause it was the first way I did them. I still use this when I want to make a sector only capture-able once. 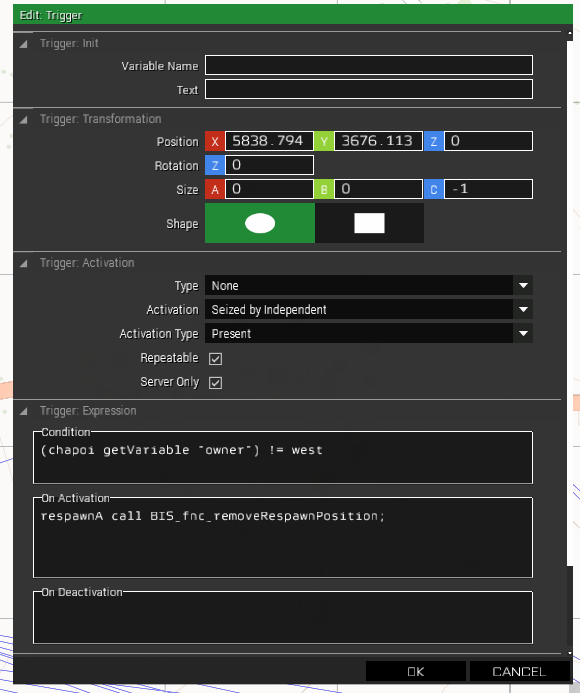 Its easier to do with a trigger as the sector like this since it can be set to be repeatable or not. See how they are synced. Right click the individual part and sync them this way. 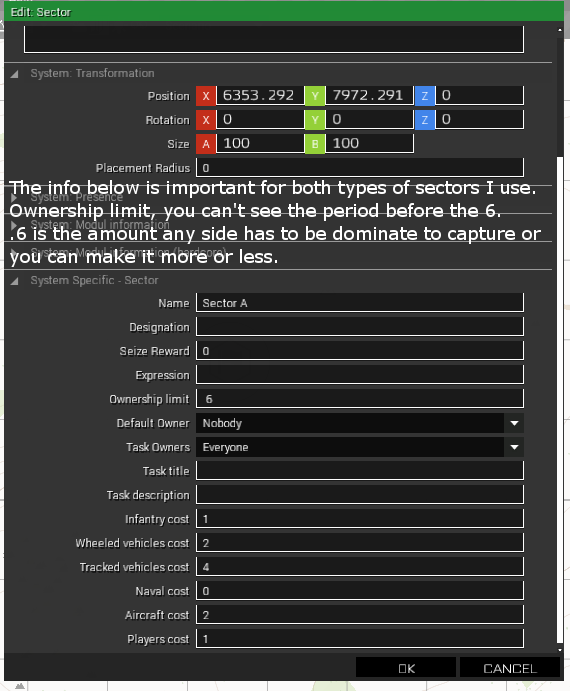 If you have more than one sector then you need to sync them to a module called sector control which is in systems/modules/ game play modes, I only have one in this in this but here it is synced to the sector control. Here is the trigger that sets the size of the sector among other things shown in the pic. Here is the whole thing with spawn point marker and its triggers for both sides. Looks like alot but if you save them in your custom compositions then all you have to do is change the names or size or time which is something I need to go into. When you set up the sector size trigger you should give it even more time than that, IMO. Here is the sector with just a sector as the marker, it holding the size and all the other setting which it also holds in the previous version. Everything except the size is set in the previous posts sector, in this one it has all settings. 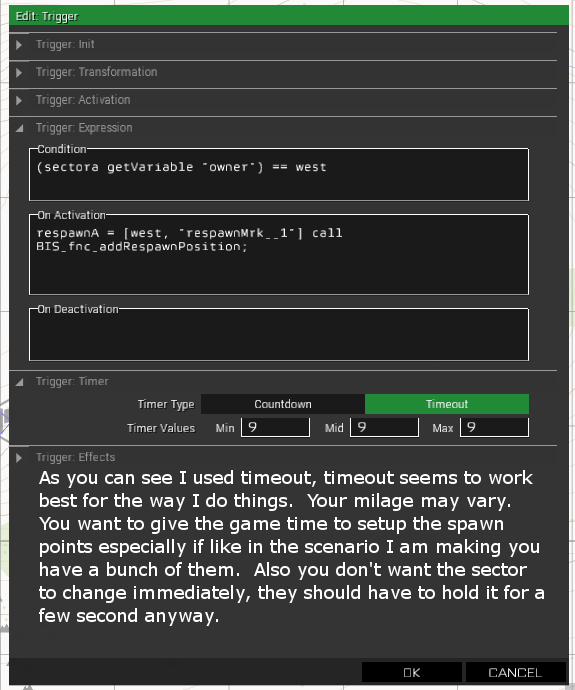 The variable name is what you use in the triggers to setup spawn points or other things connected to who owns a sector. Here is what it looks like all setup, much simpler. Okay if I get time tomorrow I will do the rest of the sector control setup, then onto placing other stuff. Making a sides equipment show after they cap a sector, only hide things once, do not rehide stuff even if the sector changes back. Everything in a multiplayer sector control/conquest scenario spawns at round start no matter what as far as I know. If you rehide stuff and someone is in that vehicle and it gets rehidden they get hidden and have to respawn. OMG HE'S BEEN DE-ANIMATED!!! Its weird, I haven't actually played the game much lately, I've only been editing or looking for stuff to use in the editor or scripts. I love editing more than I thought I would. I have found a script that you can use to attach explosives to vehicles but it needs fixed, that will take awhile. It is these side missions in editing that have caused this last scenario take 9 months. Old ARMA guys are always saying write your own scripts for everything, triggers, respawns, vehicle respawns, they come from A2 and apparently the the modules didn't work well enough in A2. Last edited by Bailing_Out; 11-17-2017 at 12:07 AM. 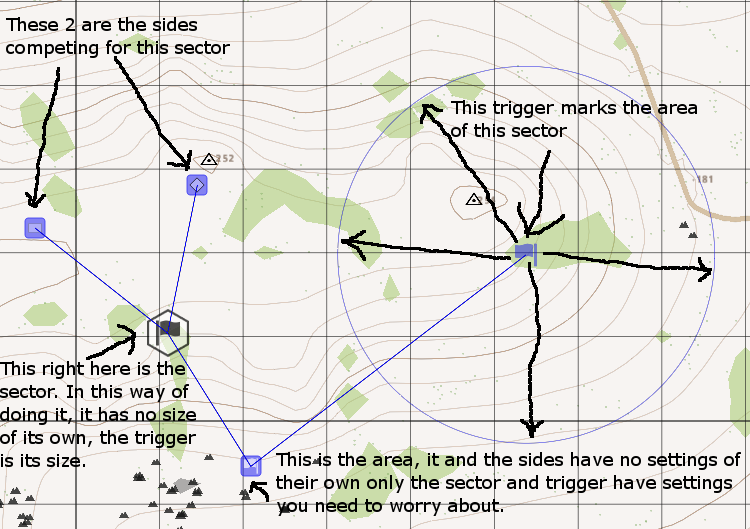 You don't have to have those triggers close to the sector, its position as for making spawn points is meaningless but it makes it easier to keep up with which one is controlling which spawns having them close to the spawn marker and sector. Here is what a 2 sector setup would look like with the sides, respawn tickets and bleed tickets modules. You'd use an odd number usually but 2 fits and can be seen better for this purpose. So far no luck making vehicles of one side stop spawning if they lose the sector close to those vehicles. I tried using a trigger to spawn the vehicles and using the conditions of who had the sector to respawn or not respawn vehicles but I found out from Pierrmgi you can't use a trigger to do that.